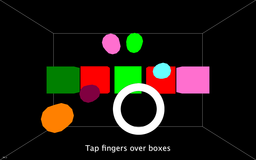 Finial release of JAMM's leap motion plugin used in Swoosh. finally got a leap motion jay. hit me up, would like to play with your patch again. i don't know why people where knocking the reviews on this thing seems to work pretty good to me. i'm well late to the game so probably most the bugs have been fixed by the time i got my unit. your plugin and example loads and runs fine. hit me up send me that git hub again so i can have the latest updates. cheers. Anyone else on the Leap Motion Developer program?